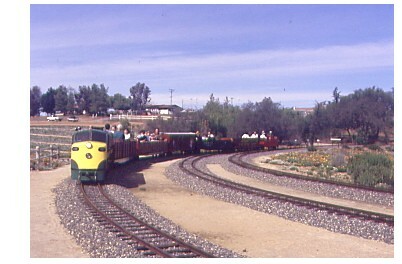 I was reading the Railroadnews.net discussion board on November 30th, 2003 I saw a post that the Bell Gardens in Valley Center had closed and that caused me a few moments of sadness, realizing that meant that the 15 inch railroad there was also closed. 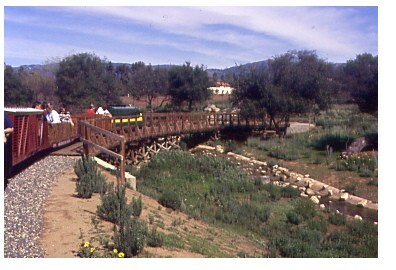 Barry Christensen and I took a trip to Bell Gardens back on February 19th of 2000 to visit and ride the railroad there. Bell Gardens was the idea of Glen W Bell and his wife Martha. Glen had ridden the rails across America and started a door to door pie business. After serving in World War II, he returned to San Bernardino and started a tiny hamburger restaurant like McDonald's. Glen was an innovator and soon made a new product, crisp-shelled tacos. Ten years later he founded Taco Bell. Under Glen's leadership the chain expanded nationwide. 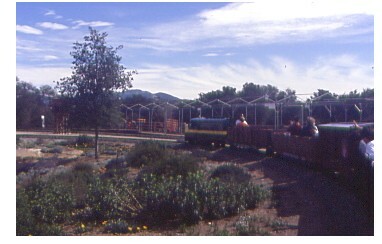 In 1978, he exchanged stock with the Pepsi Company before retiring for a love of the land, train and farming he created this beautiful park in 1993. 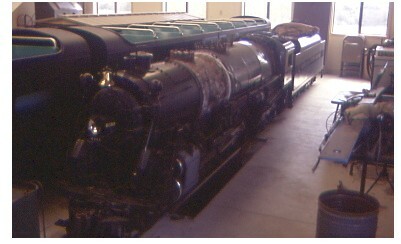 The railroad was designed from an original 15 inch 1950 locomotive. 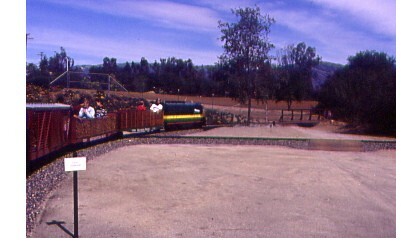 The original train was built by retirees of the Convair Division of General Dynamics in the early 1960's for an employee park. 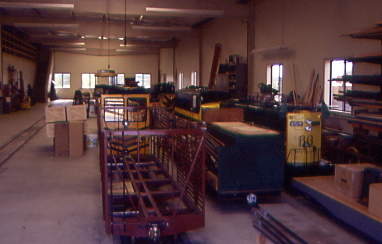 Mr Bell purchased the entire train in 1995 from the Kerney Mesa Plant. 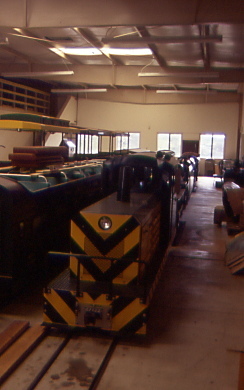 Along with the original train, in the car barn there is other railroad equipment acquired over the years. The train ride lasted 15 minutes and took us on a tour of almost the entire farm. 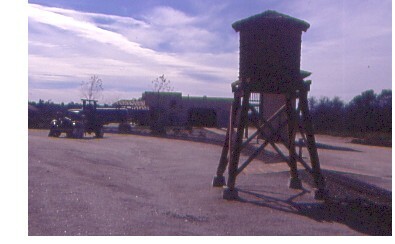 The railroad had a length of over two miles. Now let us travel back to the day on February 19th, 2000 for a trip over the Bell Garden Railroad. Barry and I drove down to Valley Center from Santa Ana and found Bell Gardens without too much trouble. We toured the property before we waited for our train ride to commence. A few minutes later here came the train into the station. 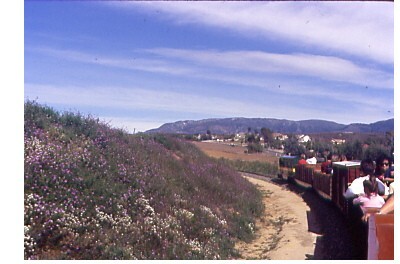 We boarded the train which finished the lower loop on the property and took us east. The gardens along the railroad were beautifully maintained. Our train next crossed over a track that would make a second western loop. 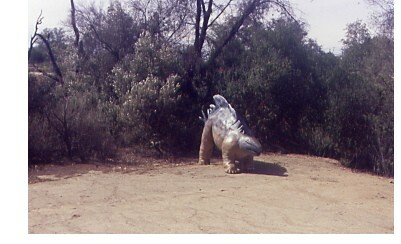 Off the left was a Stegosaurus. 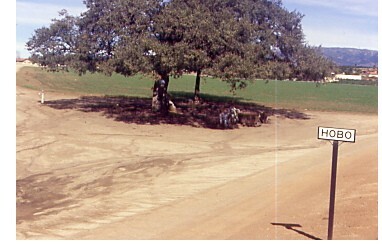 The train passed the station of Hobo with figures of that trade resting underneath a tree. We ran by a water tower and the car house to the south of our train. The train rounded a knoll with a great eastern view as we climbed to reach the higher property. 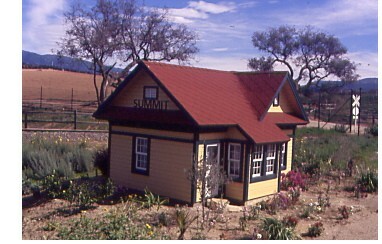 We reached the Upper Loop and took the track to the left passing a replica of the former Santa Fe Railroad Depot at Summit, California atop Cajon Pass. 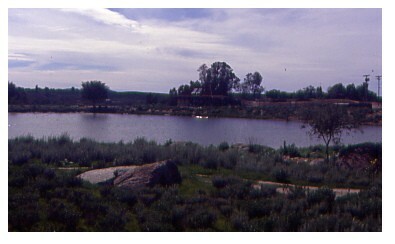 Inside the loop was the beautiful Lake Kathleen. At the top of the loop, our train crossed this nice long wooden trestle. 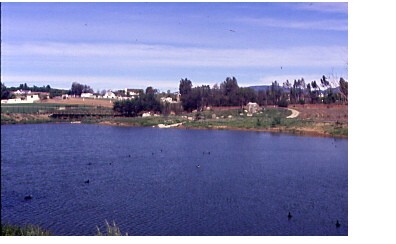 A view looking back across Kathleen Lake. 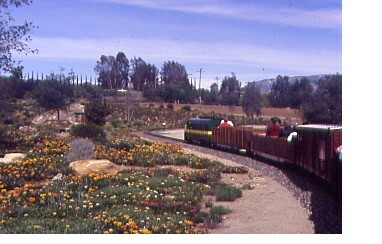 Our train next ran behind the Summit Depot as we finished the Upper Loop. 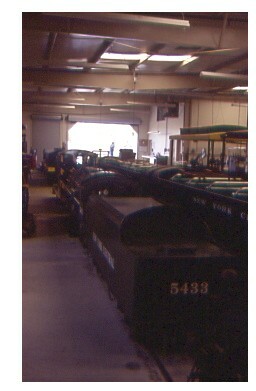 We completed our run before taking a second trip where the crew invited is for a tour of the car barn. The car barn as spacious and really well designed. Here is one of the diesel locomotives. 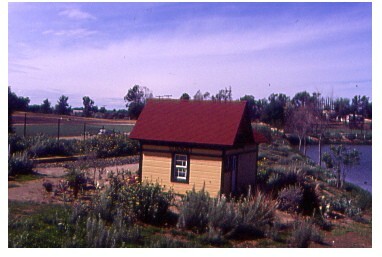 This New York Central Niagara was acquired for an estate in Montecito. 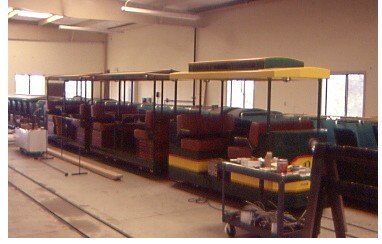 More of the passenger fleet was being worked on. Another rear view of the New York Central Niagara. This brings us to the end of our tour of that once fascinating and unique Bell Garden Railroad.